Just one bite and you will be hooked! After a taste of this Best Sour Cream Sugar Cookie you will take another bite and savor the flavor, again. It's a hint of Nutmeg! Sour Cream is another ingredient, here. 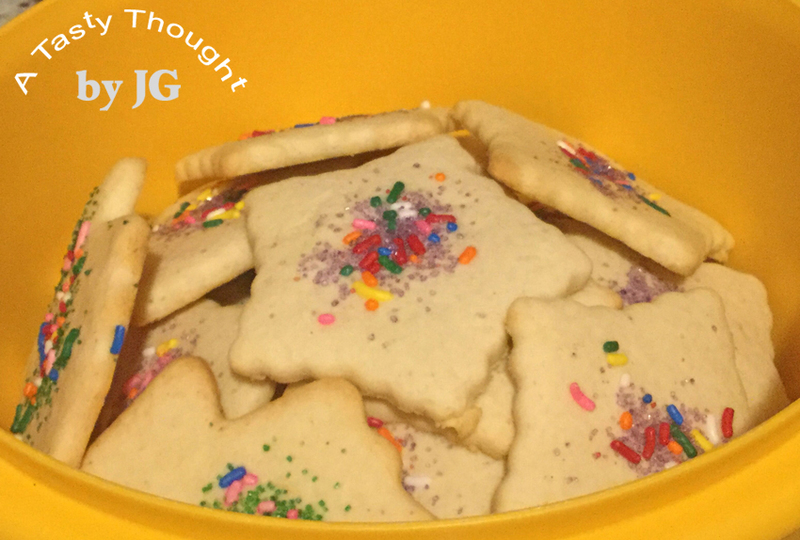 These Sugar Cookies are just the best that I've ever tasted (and baked)! Baking a batch before Christmas is now a tradition of mine. The cookies also freeze well, so many of the baked cookies are cooled and packed in freezer bags- just ready for Christmas. It's a 2 step process! On Day 1 a batch of the dough is prepared and refrigerated overnight. The next day I find my rolling pin, rolling mat, favorite cookie cutters and colorful sprinkles. Definitely my cookie pans and cooling racks, too. Before I know it, my kitchen has the great aroma of Best Sour Cream Sugar Cookies. After the first pan of baked cookies have come out of the oven and have cooled on the cooling rack, of course there is the "taste test"! Oh, yum!!! It's hard to refrain from "testing" another. Baking these yummy cookies was my project this afternoon. There sure was the required "taste test" going on! My yellowish cookie canister was filling up. Tomorrow, I'll place most of them in freezer bags to defrost next week. Best Sour Cream Sugar Cookies is a family favorite cookie and enjoying them is one of our Christmas traditions. You probably already have Nutmeg in your spice rack. Purchase a container of Sour Cream this weekend. This will be a great recipe to take out and use! My husband would love these! Thanks for the recipe! Holiday hugs!